How to make sloppy joes. We're here to teach you how to make Sloppy Joes! This is one of my favorite recipes and a family favorite. It is a recipe that is loaded with lots of vegetables. 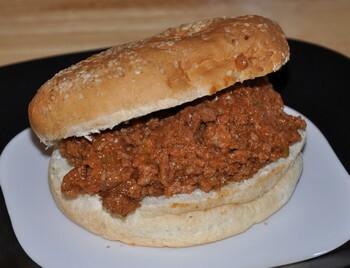 The pureed vegetables really add a lot of flavor to this sloppy joe recipe. You can use ground hamburger, ground chicken or a mixture of both. I usually use 1 pound of each and then I have extra to freeze for another meal. In blender add onion, carrots, celery and green pepper. Continue to add vinegar, ketchup, Worcestershire sauce and mustard in blender. Puree. Add to large skillet and cook with ground hamburger. Break up and stir meat. Simmer cooking about 10-15 minutes. You can prepare this in the morning and place in the crockpot or slow cooker. It also freezes really well. ~~Occasionally I stir in chopped hot dogs in the last 5 minutes of cooking. We call these Sloppy Joes and Toes. I like this variation of Sloppy Joes with an addition of tomato juice. Brown beef and drain. Add tomato juice, mustard, ketchup and onion into the ground beef. Season with salt and pepper. Simmer on low for 20-25 minutes. Serve on buns. 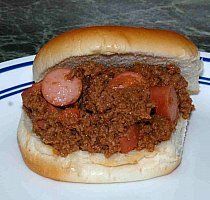 Share your Sloppy Joe recipe.